For a long time, scientists evaluating the global carbon cycle considered rivers and streams akin to pipes, channeling carbon and other solutes from the land to the sea. Today, however, scientists know that along the way these inland waters also "breathe" carbon and other gases into the atmosphere. In fact, the critical role of this greenhouse gas "evasion" from rivers and streams was, for the first time, incorporated into the Fifth Assessment Report of the UN's Intergovernmental Panel on Climate Change in 2014. 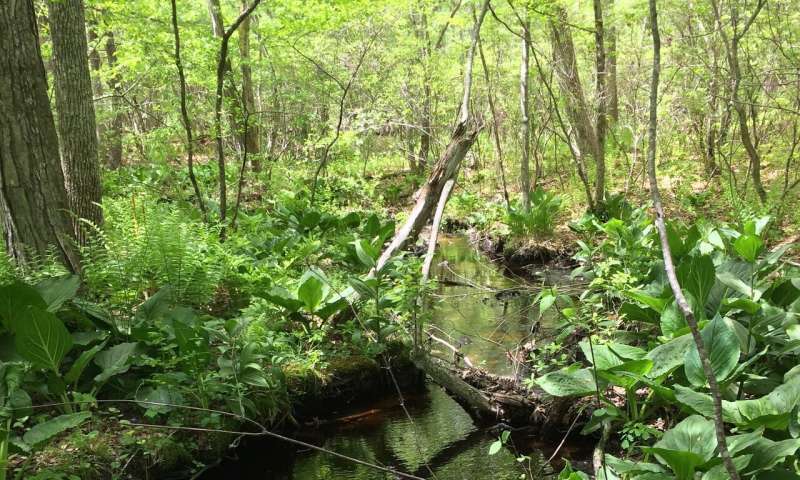 In an analysis of headwater streams in central Connecticut, scientists found that concentrations of three greenhouse gases—carbon dioxide, nitrous oxide, and methane—increased in wetland streams during rainstorms, but decreased or remained constant in forested streams. However, those gases were also less likely to be released from the wetland streams than from the streams in forested areas, they found. "When you think about what a wetland looks like, it makes sense: wetlands are really flat, which is why water and organic matter may accumulate there," Aho said. "As a result, during a rainstorm those wetlands and their soils are a source of greenhouse gases." Understanding these dynamics, Aho said, will be critical in order to develop more accurate carbon cycle projections and climate models—particularly as extreme weather events are projected to increase in the coming decades. "If a researcher is looking at carbon sequestration from a local perspective, they might be just monitoring what goes in and out vertically within a plot of land," she said. "But if that area includes a wetland stream, for instance, the gases are likely to flow away from the plot they're looking at; the carbon may be released into the atmosphere outside of their point of view, so you may totally miss it. So it's important to think about this idea of lateral transport.